The Northern California Women's Caucus for Art (NCWCA) is a networking organization for women in the arts. We offer a broad range of events and programs: member forums, exhibitions, art-making, art activism and community. 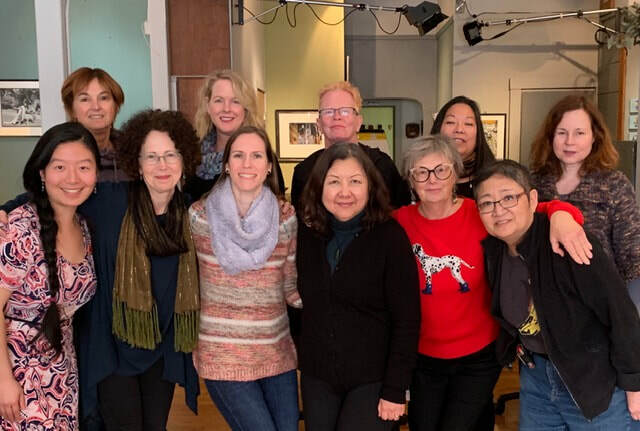 2019 Board Retreat Participants (Back Row L to R) Marguerite Elliot, Karen Gutfreund, Melissa Harmon, Judy Shintani, Tanya Augsburg. (Front Row L to R) Angela Han, Elizabeth Addison, Sawyer Rose, Priscilla Otani, Mary Shisler, Sandy Yagi. We have lots of fun volunteer opportunities for the F213 exhibition and related programming. There's a task for everyone's taste! Detail oriented? There's a spot just for you. People person? We've got that too...and so much more. It's easy! Click the SignUp logo below and choose a spot or more from many selections. NCWCA thanks you for helping to make this exhibition a huge success. ​NCWCA welcomes Sheila Pree Bright, artist and author of #1960Now: Photographs of Civil Rights Activists and Black Lives Matter Protests on Thursday, May 2 at Arc Gallery as part of the Amplify! Writer's Evening. WHERE Sports Basement, 2727 Milvia St, Berkeley. NCWCA offers monthly meetings on the second Tuesday of every month except December and January. In December, we hold our traditional year-end party and in January the board goes on a full-day retreat to review goals for the new year. In addition to monthly meetings, we offer periodic activities such as Art Tag; visits to galleries or museums, professional development classes, Land Art Day, and one-day conference or symposium. For the second year in a row, NCWCA has been selected to be a Cultural Partner of Art Market. This means we get a free table to share information about all of the exciting events and opportunities offered by NCWCA. Please help promote our wonderful organization by welcoming visitors for a couple of hours at the NCWCA table on April 25-28. Click the button below to select your Ambassadorship! Your donations make a wide range of exhibitions, professional development programs and special events such as Bay Area Art Stars possible. Thank you for your generosity!